Here at Lot Pro, we continue to wonder why Mazda doesn't sell more Mazda6s. Because even though it's a midsize sedan, like every other vehicle Mazda produces (that's every one) it's a driver's car in every sense of the word. The latest Mazda6 is available in three trim levels. 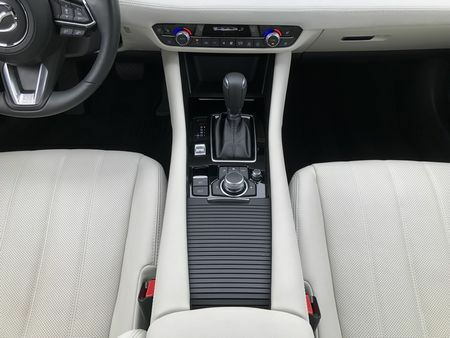 Not only is it, in our opinion, the best-looking midsize sedan out there, both inside and out, it’s also one of the few remaining midsize sedans that's offered with a manual transmission. The third-gen Mazda6 was unveiled in North America at the 2012 Los Angeles Auto Show, going on sale in January, 2013 as a 2014 model. It is underpinned by the same SKYACTIV platform as the CX-5 crossover and Mazda3 hatchback and sedan. 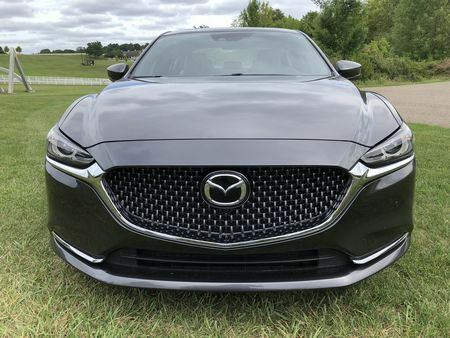 For the 2018 model year, Mazda has added a new trim level (Grand Touring Reserve), cylinder deactivation to the normally-aspirated 2.5-lliter engine on Sport and Touring models, along with additional equipment across all trim levels, including the Mazda6's first-ever turbo for Grand Touring, Grand Touring Reserve, and Signature models. 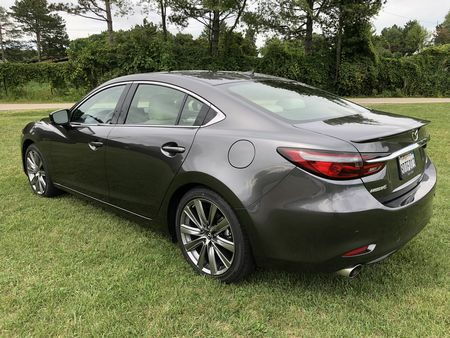 Despite competition from newer models in the segment, the Mazda6's elegant "KODO-Soul of Motion" design language keeps it at the top of the mid size class. For 2018, the front fascia was cleaned up with the requisite five-point grill featuring a new pattern and bolder wing-shaped chrome trim that traces the lower two-thirds of the grille until it meets and bisects the "eagle eyed" headlamps with integrated fog lights. 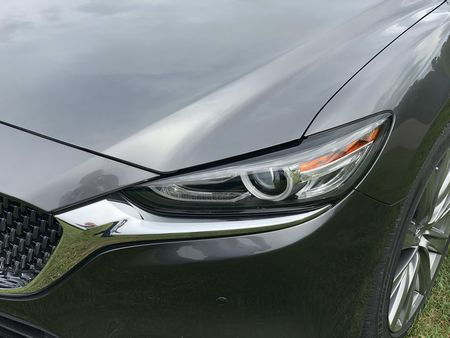 LED headlights and taillights are now standard on all models, while below the grille a lower valance with a narrow lower air intake is flanked by pods that house small, round, LED fog lights – all of which sits above an aggressive lower air dam. 17 x 7-inch aluminum alloy wheels wrapped in P225/55R17 all-season tires are standard on Sport models, while Touring, Grand Touring, Grand Touring Reserve, and Signature models (like our tester) come with 19 x 7-inch alloys - finished in brilliant silver on the Signature trim and wrapped in Falken ZIEX ZE001 P225/45R19 all-season tires. Inside, more soft-touch materials have been added, with Nappa leather, synthetic suede, and Japanese Sen Wood on the menu for upscale trims. 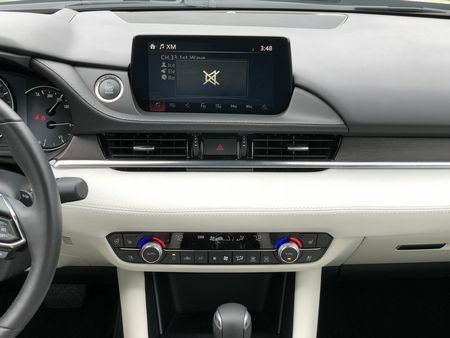 A free-standing eight-inch, upper dash touchscreen gives the cabin a very open feeling, while Signature models also receive a seven-inch TFT instrument cluster. A horizontal Sen wood trim strip on our Signature tester extended from the instrument binnacle to the passenger door, with the space between it and the glove box door filled by a stitched, Alcantara panel (those who lust after the Audi A6 interior could easily save themselves thousands by choosing a Mazda6 Signature). 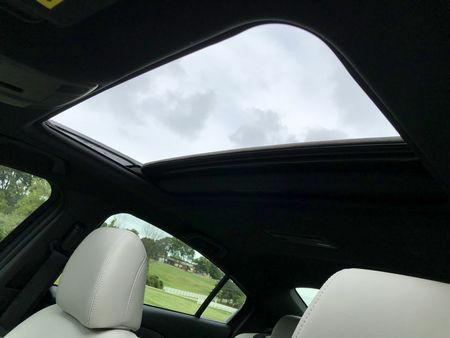 Drivers face a stitched instrument binnacle hood and, on Grand Touring Reserve and Signature models, a head-up display, while sides of the center console are also covered in a stitched, soft-touch, material that varies by trim level. The instrumentation is straightforward and easy to read with a prominent center speedometer flanked by a tach and multi-information center. 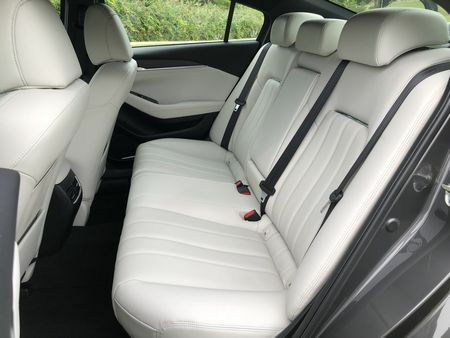 Front seat occupants are treated to new and incredibly comfortable seats with plenty of knee, leg, and head room. The cooling function on Signature models - sucking heat away rather than blowing cool air on your bottom – works even better than pitched, the back seats are also comfortable, even with a third passenger, while the trunk's wide opening, large pass-through, and split and fold back seats greatly add to the Mazda6's versatility: with the rear seats flipped forward, we were easily able to load a 52cm road bike without having to remove the wheels. The driver’s view out the front and sides is very good, despite the side mirrors taking up some of the real estate. The view out the rear three-quarters and back isn’t quite as good - the sloping roofline and high deck lid cut down on those site lines. 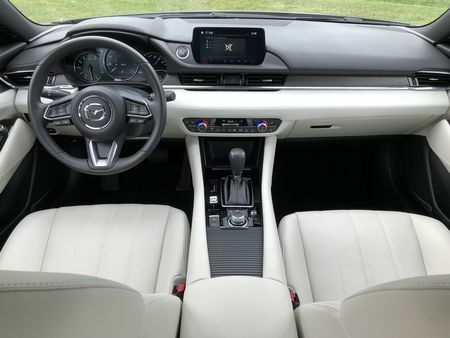 At the same time, although Mazda has added sound-deadening materials to its flagship sedan, interior sound levels – surprisingly - still aren't class leading. 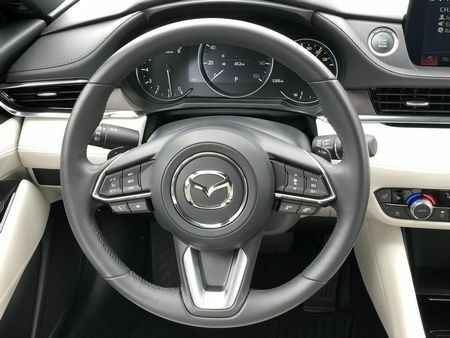 Secondly, the console mounted infotainment control knob, though located in a more ergonomically-friendly manner than on other Mazda models, only manages a mediocre job of reducing driver distraction. Frankly, we miss the simpler and less-distracting buttons and knobs of the older system – especially when it comes to functions like adding station pre-sets. 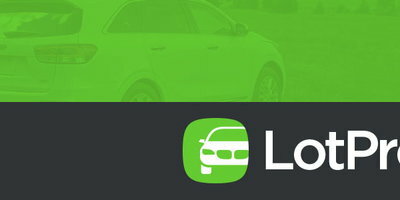 Finally, while the infotainment system on our Signature tester displayed both Android Auto and Apple CarPlay screen icons, even after pairing an iPhone and plugging it into a USB port, we were unable to activate this feature (Mazda has noted in the past that it will be available sometime in the future). The infotainment system's controller unit is also both cumbersome to use and distracting. For 2018, two engines are offered. The first, assigned to Sport and Touring models, is impressively efficient direct injection 2.5-liter 4-cylinder that delivers 184 horsepower and 185 lb-ft of torque. It can be had with either a 6-speed manual (in Sport trim only) or a 6-speed automatic (optional on the Sport and standard on the Touring). Fuel economy is an EPA-estimated 26 miles per gallon in the city, 38 on the highway, and 31 combined with the automatic and an EPA-estimated 25 mpg city, 37 highway, and 29 combined when paired with the 6-speed manual. All new to the Mazda6 for 2018 is a 2.5-liter turbocharged four-cylinder – also found in the CX-9 – that generates 250 horsepower and 310 lb-ft of torque, matched with a six-speed automatic and standard on Grand Touring, Grand Touring Reserve, and Signature models. Fuel economy is an EPA-estimated 23 miles per gallon in the city, 31 on the highway, and 26 combined. We managed to score a vehicle-measured 28.2 mpg in a combination of spirited city and highway driving. This year's big news is the 2.5-liter turbocharged engine that supplies plenty of off the line acceleration as well as effortless highway passing. Toggle the Sport mode switch and the transmission holds gears longer and offers energetic downshifts. 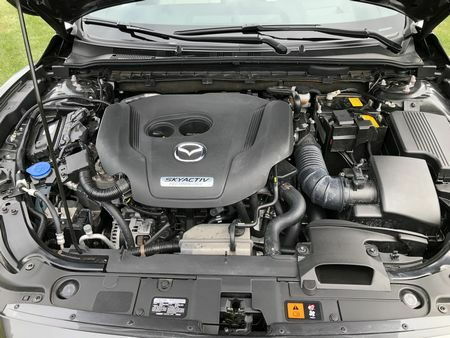 Even the base 2.5-liter normally-aspirated engine is no slouch, although this year Mazda chose to drop the i-Eloop regenerative engine braking system in favor of the first industry-wide application of four-cylinder engine cylinder deactivation technology. 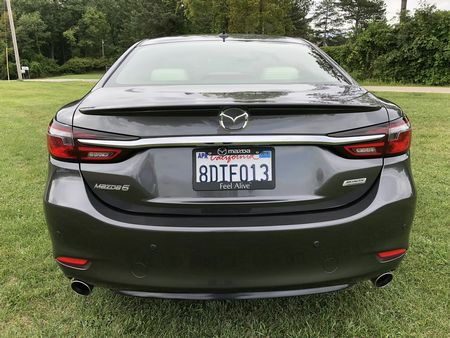 We readily admit that some will find the suspension tuning of the Mazda6 to be overly firm, which it is – compared to the pillowy - but uncertain - handling espoused by many of its peers. 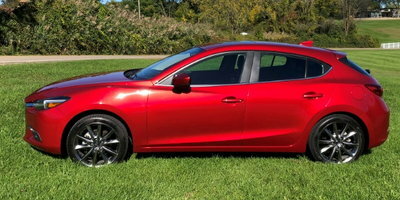 But the Mazda6's combination of light weight (3,200 pounds in base trim), excellent steering feel, and balanced, sporty ride make it the most entertaining sedan in the mid-size class, while the engine management system (G-Vectoring Control) is a boon not only to confidence during cornering, but also to straight-line acceleration and stability. The result is a ride that is compliant and well damped. Potholes and other road imperfections are handled with ease. The steering is direct with great feedback to the driver, while braking is also excellent with very short stops and a pedal that's easy to modulate. Point the Mazda6 into a corner and it tracks flawlessly with no body lean. Even at freeway speeds, the Mazda6 feels extremely stable - unaffected by crosswinds or grooved pavement. The combination of suspension tuning and precise steering means you always know exactly where you are on any road. 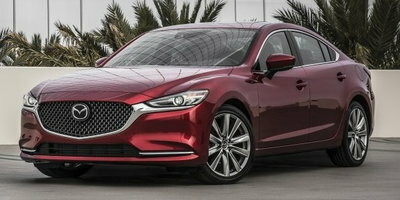 But at the same time, the base engine can feel unrefined, the splendid turbo-four is only available with an automatic, while even we admit that the Mazda6's sporty ride – even on the Sport model which features 17-inch wheels and tires with higher, more forgiving sidewalls – isn't for everyone, and may turn off drivers used to a soft, pillowy ride. In addition to engine and trim level additions, Mazda has made a number of changes to the Mazda6 lineup for 2018. The CD player is dropped from all models. The entry-level Sport trim receives a new alloy wheel design, LED headlights, LED front and rear turn signals, dual-zone automatic climate control, and low-speed automatic emergency braking. 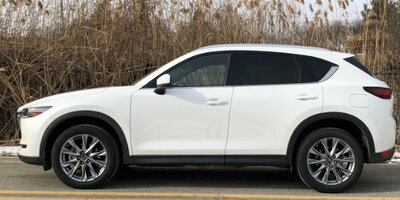 Touring models now come standard with LED headlights, LED front and rear turn signals, a new 19-inch alloy wheel design, moonroof, rear seat center armrest with storage and two USB charging ports, automatic emergency braking, adaptive cruise control, lane keep assist, lane departure warning, and automatic high beams. Navigation has been dropped. 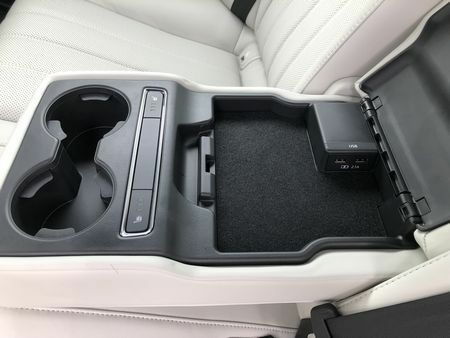 New standard equipment on Grand Touring models includes a new 19-inch alloy wheel design, rear seat center armrest with storage and two USB charging ports, automatic emergency braking, adaptive cruise control, lane keep assist, lane departure warning, and automatic high beams. 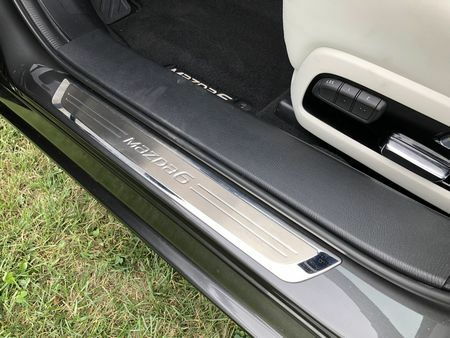 Features dropped from the model (some of which now appear on the Grand Touring Reserve trim) include LED fog lights, adaptive front lights, rear spoiler, alarm system, leather seats, and a power front passenger seat. Grand Touring Reserve models receive LED headlights with adaptive front lighting, LED front and rear turn signals, windshield wiper de-icer, rear lip spoiler, automatic emergency braking, adaptive cruise control, lane keep assist, lane departure warning, automatic high beams, leather-trimmed sport seats, full color head-up display, ventilated front seats, power front passenger seat, driver's seat memory, heated rear seats, rear seat center armrest with storage and two USB charging ports, and a heated steering wheel. Finally, added to the Signature model's long list of standard features is a new 19-inch wheel design, LED headlights with adaptive front lighting, LED front and rear turn signals, gunmetal front grille, rear seat center armrest with storage and two USB charging ports, full color head-up display, 360 view monitor with front & rear sensors, Nappa leather seats, Sen Wood trim, Ultrasuede trim, frameless rearview mirror, black headliner, unique stitched leather-wrapped steering wheel, overhead console LED courtesy lights, automatic emergency braking, adaptive cruise control, lane keep assist, lane departure warning, and automatic high beams. 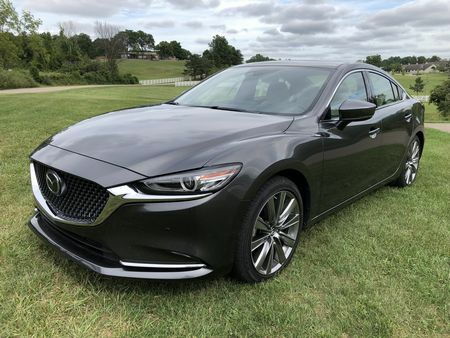 2018 Mazda Mazda6 pricing starts at $22,840 for a manually-equipped Sport model and can top out at over $36,000 for a fully-equipped and accessorized Signature model. Our Machine Gray Metallic Signature model was very close to the top with a base price of $34,750. 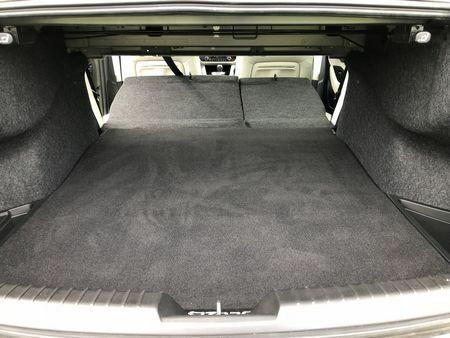 Adding $75 for a cargo mat, $300 for the paint job and $125 for brushed aluminum door sill trim plates brought the total, including an $890 delivery, processing and handling fee, to $36,140. There isn’t much we don't like about the latest Mazda6. 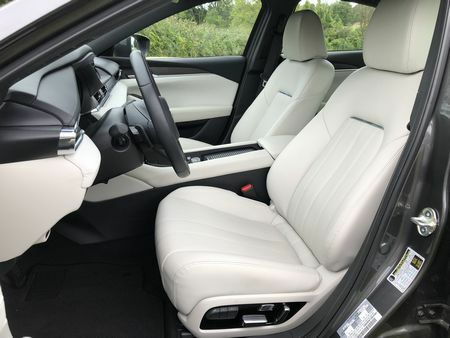 It's true that its ride is far from plus, the interior is a bit snug, we preferred the redundant buttons found on the previous generation as the current one is more difficult to use, while the more powerful turbo is automatic-only. 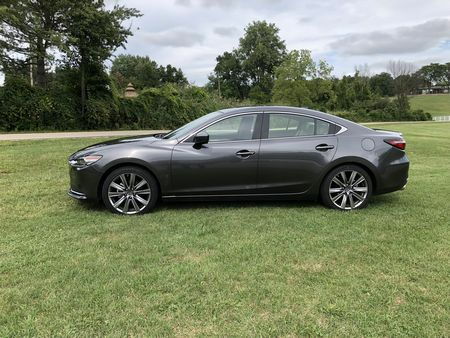 But the 2018 Mazda6 remains a top choice in its class not only because we have more fun driving one than any other sedan in its class, but also thanks to its stunning exterior, agile handling, and pair of entertaining and fuel efficient engines.